Restaurant Hood Cleaning Solutions in Tampa, Florida. Over 22 Years Experience and Complete Customer satisfaction guaranteed on every project. 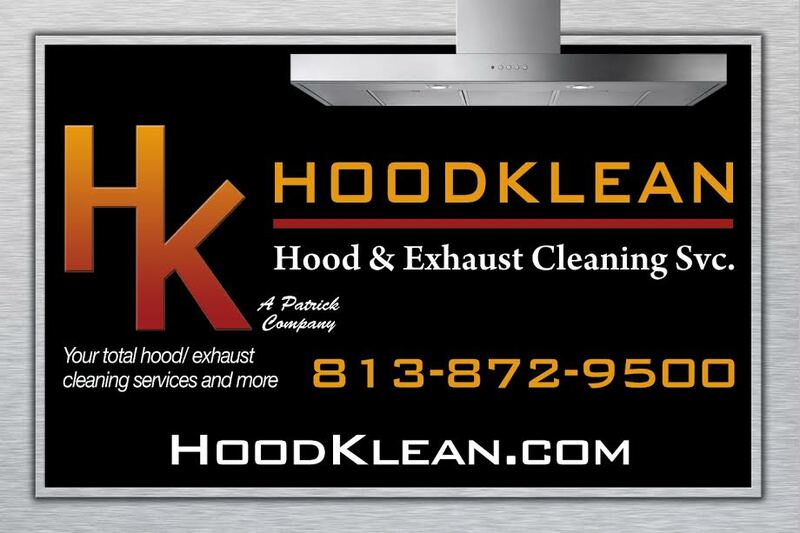 HoodKlean will insure that your hood system is operating at peak performance so you can focus on food service. We provide reliable kitchen exhaust cleaning and maintenance programs to many types of venues. We operate in compliance to Standard for Ventilation Control and Fire Protection of Commercial Cooking Operations. The 2011 NFPA 96 is the current code to ensure that equipment is maintained by qualified providers. Kitchen fires are commonly caused by poorly maintained hood systems. These fires can cause complete restaurant destruction. Here at HoodKlean we bring the most current fire prevention standards to every job. Hood Cleaning is an essential maintenance for commercial kitchens and restaurants. Proper monitoring and maintenance of your kitchen hoods will not only keep you compliant, but will prevent dangerous fire hazards in the long run. NFPA-96 Standard section 11.4 provides the minimum fire safety standards related to the design, installation, operation, inspection and maintenance of all public and private cooking operations. It also states there the qualifications of a proper hood cleaning provider. All commercial kitchen operators should comply with this standard. Cooking different kinds of foods results in a grease build up in your kitchen. Continuous grease build up over time can result to fire which can be devastating for your business. Studies show that one of three fires in the United States is caused by restaurant fires. When your kitchen hoods are well-maintained, there is a low chance of fire accident. Hood systems should be monitored and inspected overtime at regular intervals. How Often Do I Need My Vent Hoods Cleaned? Your cleaning schedule will depend on your usage and the type of hood you have in your kitchen. NFPA-96 Standard requires cleaning to be done monthly, quarterly, semi-annually or annually depending on the amount and type of cooking taking place. Having clean kitchen vent hoods improves the air circulation in your kitchen. It can help in preventing carbon monoxide poisoning which is harmful for those who dine in your restaurant. It also creates a comfortable working environment for you and your employees. Also, it can help in improving the efficiency of your kitchen equipment, and may help you lower your energy bills. When your kitchen equipment is efficient, it can give your more production at lower cost. Lastly, your business will be compliant to the NFPA-96 Standard which will help you stay in the food business. Our more than 25 years of experience in this industry is what separates us from other commercial hood cleaning providers. Many restaurant owners believe they are getting a complete hood cleaning but in reality they are just getting a hood “washing”. We know the importance of hood cleaning for your business. Our technicians provide a thorough cleaning of your kitchen hoods and look for hidden areas where grease build up is high. We not only focus on things seen by the naked eye but we focus more to the inner workings of the system, such as hoods, duct works and the fans. We do an entire inspection of your system properly, and use modern equipment to clean hard to reach areas in your kitchen hood systems. All our technicians and supervisors are licensed and insured so you can be sure that they are qualified for the job. Being knowledgeable of the NFPA-96 Standard required for hood cleaning is essential for the success of your vent hood cleaning program. We only clean your kitchen hoods using the guidelines provided in NFPA-96 Standard. The basic principle of ventilation is that contaminated air is exhausted outside the atmosphere, while being replaced with clean and fresh air. This also applies to kitchen ventilation regardless of the size and design of a kitchen. What makes it different is that kitchen exhaust systems produce large volumes of air. For this reason, food service industry standards for ventilation are more complex than a standard exhaust system. What is Kitchen Exhaust Cleaning? Kitchen exhaust cleaning is the process of removing greases that have accumulated inside the ventilation systems of commercial kitchens. A proper cleaning of the entire kitchen exhaust system includes the hoods, filters, fans and all associated horizontal and vertical duct works. It is important to monitor this because when left unclean, these exhaust systems can accumulate grease over time which is extremely prone to fire hazards. Primarily, the leading cause of restaurant fire is a blocked exhaust system. Your attention and feedback are of paramount importance to our company. If you’re in need of a quote for service, repair, or unscheduled maintenance request, please complete the information requested below. A knowledgeable member of our staff will contact you within 24 hours.